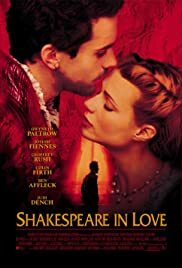 BEFORE: Shakespeare in Love marks the end of the Best Picture chain and also marks the end of the first month of the movie marathon. I did watch this film before around 2007-08 when my English teacher recommended it after reading Romeo & Juliet. Like Inglourious Basterds, I remember liking this film but I don’t remember too much about it which is why I’m watching it again. To celebrate the end of one month of movies, I’m reflecting on some milestones I’ve reached. In 31 days, I have watched 32 films for a total time of 4007 minutes or 66.78 hours. I’ve been pleasantly surprised with the quality of the films with five, 5-star films and an average rating of 3.63. All of my write-ups have totaled 11,576 words which is almost a quarter the length of a novel. It’s been a lot of fun so far and I’m really looking forward to continuing this for another 11 months. Just 334 films to go, well, minus this one, so that leaves only 333 films left this year. However, my original list of 636 films has ballooned to 730 (not including the films I’ve already seen) meaning I’ve been adding an average of three films for every one I watch. At this rate, the marathon could last quite a while. AFTER: As far as I know, Shakespeare in Love was the first comedy to win the Best Picture award. (It may not be the only one, but I’m pretty confident that comedies don’t typically win the award and that this win was big news in 1999.) The film was quite funny at times but with the story being similar to Romeo & Juliet there were also moments that were less than comical. Maybe its because I’ve seen the film before, or that I’ve heard the story of two forbidden lovers repeated far too often in films, but the pacing seemed to drag the film down at points. This film is loaded with a whole bunch of A-list stars. From the nominated Gwyneth Paltrow and Dame Judi Dench, to Colin Firth and Geoffrey Rush, the performances given were extraordinary. But the runaway performance by far has to be from Imelda Staunton (Professor Dolores Umbridge in the Harry Potter series) who plays Paltrow’s kind and caring nurse; a character at the extreme opposite of Umbridge, yet she plays it so convincingly.